With the UK economy facing its first double-dip recession since 1970, small businesses have to become more ingenious at attracting their prospects’ attention and a share of their wallets. With traditional advertising methods (print, radio and/or TV ads) becoming more expensive yet remaining as inoportune at reaching narrow audiences as always, entrepreneurs should look for alternatives. While most people associate non-traditional advertising with online marketing tools (online banners, email marketing, etc. ), these tend to work on the same concept as the offline ones, just that they’re supported by a different technology. The Internet won’t change things if you don’t change your approach. So instead of reaching the many to impact the very few (and hoping that those will see your message) why not impact the few in order to reach the many. Here’s a quick comparison between Traditional and Non-Traditional Advertising and why the latter fits the SME agenda better. All of the three atypical advertising channels mentioned in the presentation above (namely Guerilla Marketing, Content Marketing and Digital Signage) help marketers provide information about their company in the right context and create engagement with an influential audience. 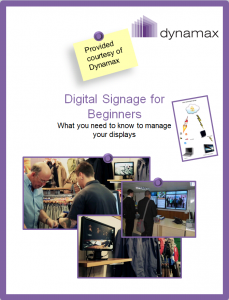 To find out more about marketing your business using digital signage, download our whitepaper- ‘Digital Signage for Beginners’.